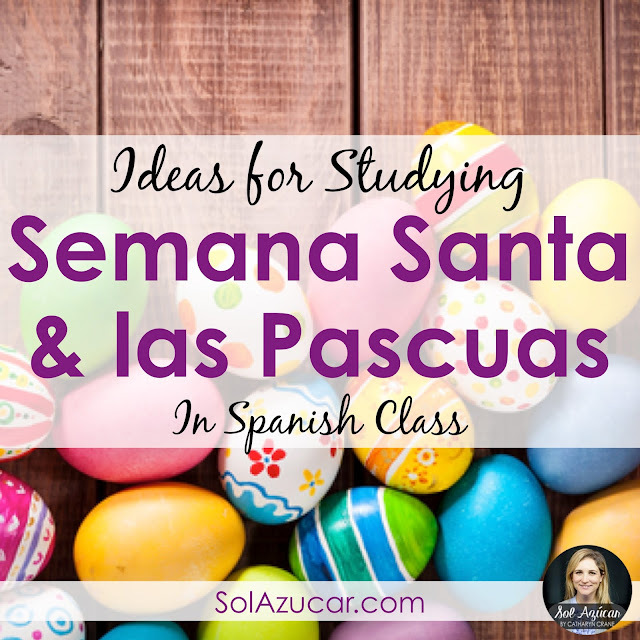 As a public school teacher, semana santa and las pascuas are topics I typically tended to steer away from in Spanish class. I did this because I didn't want to worry about bringing religion into my classroom. This was so narrow minded. When exploring the culture of the Spanish speaking world, to ignore Catholicism, its holidays, and cultural practices would just be ridiculous. We Spanish teachers know this, but how do we justify teaching these topics? The VAST majority of Latin Americans are Catholic (see this Pew study for statistics). Catholic traditions and practices are central to Latin American and Spanish culture. Teaching culture is central to the World Readiness Standards for Learning Language. Furthermore, learning about other cultures and religions is a great way to foster students' acceptance of diversity. 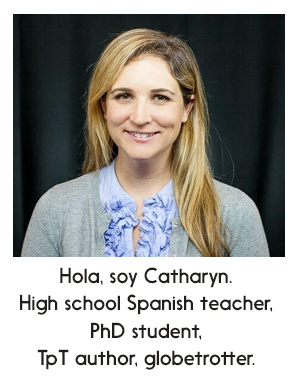 Learning about the culture behind the language makes Spanish class relevant for students. Understanding Spanish speakers makes the language come alive. Here are a few ways to bring semana santa and pascuas to your middle or high school Spanish classroom. I hope you'll share your own experiences and ideas in the comments as well. Cascarones are hollowed out egg shells that are filled with confetti. When they break open, the confetti flies. 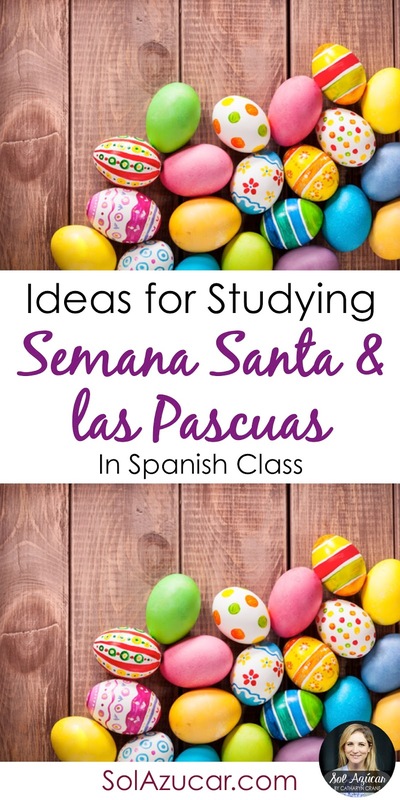 I love the idea of making cascarones with students because it is an authentic craft activity, kind of like why I love paper mache projects too! This blog post details step by step how to make them. It is a cheap, relatively easy activity, once you are able to save up enough hollowed out eggs. In my experience, taking time for crafts like this is always particularly memorable to students, especially if prefaced with a short discussion of how cascarones are used in Latin American culture. Plus what middle / high schooler won't love to break 'em over each others heads for good luck! I let students view / listen independently on their own devices or in the computer lab, and then create a mind map to demonstrate their learning. Idea 1: Estudia Feliz offers a TPRS Story Lesson on Semana Santa in Guatemala. They provide a lovely powerpoint and supplementary materials, completely free to download. I rarely do TPRS in class, and if I do, it would be called TPRS light, at best. I know some of you rock the TPRS. But others might be like me, a little scared, and in need of a little push to try something new. Well, give it a go with this lesson. It's completely free and nicely put together. This could be set up as a teacher lecture or as an inquiry activity. Give students the list and their calendars, and they search for information online or in resources you've selected for them. This idea isn't cultural in nature, but it is fun, timely, and a great way to get students up and moving when many have spring fever. Get your hands on some plastic easter eggs to set up a class egg hunt. You could take lots of different angels with this - one idea is to place a task card inside each egg and when students find the egg, they must do the task in order to go on and hunt another egg. Students could work in pairs or alone. Don't have task cards ready to go? Scavenger hunt clues - Students write up a scavenger hunt using preposition words to provide clues to the next egg - this activity will take a few days to plan but students will have a ball. 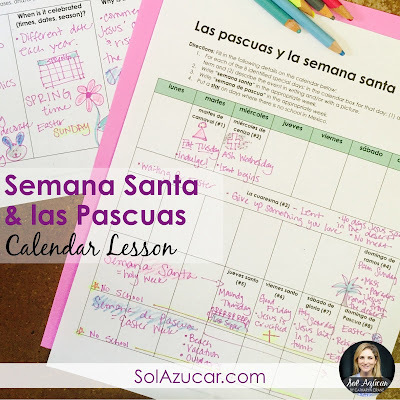 How do you celebrate semana santa and pascuas in your classrooms? Man this is such a great post. Thank you and ¡Feliz Pascua!